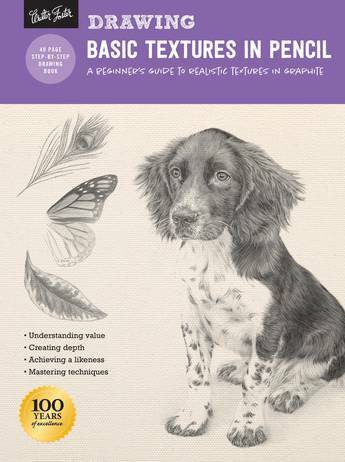 Basic Textures in Pencil introduces beginning and aspiring artists to fundamental concepts related to creating realistic textures with graphite pencil. Get the background in drawing that you need to dive into creating textured works like a pro with Drawing: Basic Textures in Pencil. From handling the pencil and mastering basic techniques to learning about value, form, and shading, Basic Textures in Pencil teaches beginning artists all of the elements needed to achieve realistic results in their drawings. Helpful and intuitive step-by-step lessons then demonstrate how you can put your newfound skills to use by rendering everything from metal, glass, and wood textures to fur and feathers. Each concept is clearly explained in easy-to-comprehend language, making this book an accessible and approachable resource for beginning artist and art enthusiasts. Designed for beginners, the How to Draw & Paint series offers an easy-to-follow guide that introduces artists to basic tools and materials and includes simple step-by-step lessons for a variety of projects suitable for the aspiring artist. Basic Textures in Pencil allows artists to widen the scope of their abilities, demonstrating basic pencil drawing techniques that allow beginners to re-create a variety of common textures and surfaces.